Pole Banners, Back Drop Banners, Step & Repeat Banners, Snap Graphic Banners & More! Retractable Banner Stands, Roll Up Banners, Pull Up Banners For Special Events, Conferences & Trade Shows! 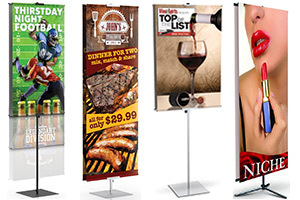 Retractable banner stands are the most popular type of scrolling banner do to the quick and easy setup. The roll up banner graphics are housed inside the stand base making setup quick and easy. This offers protection of the banner graphics while in transit or when not in use. Easily pull up the retractable banner graphic when ready to use. 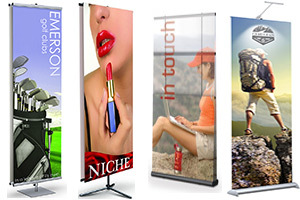 Retractable banners are available from economical pricing to higher end price points. Telescopic sizes range from 24 - 60" wide, and from 36" - 96" high. One and two sided banners available. Banner display carry bags are included with some models or sold separately. Pole Banners are vertical banner displays that feature top and bottom dowels that are inserted through banner graphic pole pockets. Easily extend the telescopic pole to desired height and re-tighten with lock that allows quick height adjustments. Round, square and travel bases available. These stand up banners are light weight, portable and easy to travel with. Back Drop Banners are utilized for step and repeat banners which consists of one or more logos repeated in a step and diagonal alternating pattern. This background design on a custom printed banner helps company’s effectively promote and reinforce their brand during events such as photo shoots, media, parties and red carpet events. Back drop banner sizes range from 24"w - 42"w, 30"w - 48"w, 52"w - 96"w. Telescopic height expands from 36"- 96" high. 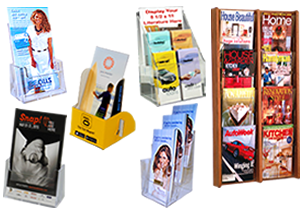 Snap Graphic Banner Stands enable you to quick and easily insert your fabric or vinyl banners into open snap graphic grippers and clamp it into place. Sizes range from 22"w - 60"w x 70"h. Bottom crossbar can be set at 28", 36", 48" or 60" from top. 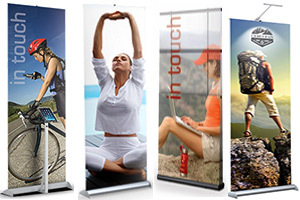 Footless Stand Up Banners offer floor-to-top graphics with no visible feet. Some features include a spring loaded graphic tension and a quick two minute assembly and take down. These vertical banners are suitable for any substrate. Size ranges from 24" - 48" wide and 42" - 96" adjustable height. 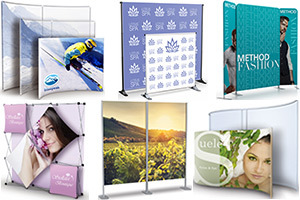 Harmony Banner Stands are the worlds easiest to assemble portable banner. Easily slide pillow case graphics over the "U" shaped tubing and pull down. Pull up banner graphics when done. Its that simple. Our state of the art printed fabric banner does not wrinkle and can be used over and over again looking brand new each time. Tubes feature shock-cords and swag & spring button construction. Available sizes are 24"w x 84"h, 30"w x 84"h, 36"w x 84"h.
These marketing banners are just a few trade show promotional tools that can be utilized for trade show booths and pop-up exhibits. Brand awareness is important for businesses to be instantly recognized and is important if you want people to take notice. 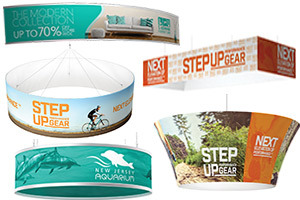 Any of these eye-catching promotional banners, complete with bold and bright colorful graphics will effectively grab the attention of potential customers. A well planned advertising strategy will not only result in more profits but can ultimately create more exposure for your brand, product, or service. Please call our office today @ 866-550-0656 with any questions or if you cannot find what you are looking for on our website our knowledgeable customer service representatives will help point you in the right direction and find the right display for you.